(AllPolitics, November 3) -- House Democratic Whip David Bonior turned back a challenge from GOP candidate Brian Palmer to win Michigan's 10th congressional district seat. Though he is an 11-term veteran of the House and part of the Democratic leadership, Bonior's southeastern Michigan seat leans Republican. In 1996 he was locked in a race too tight to call long after the polls had closed, and this year he faced a candidate in Palmer, a wealthy businessman, who had more campaign cash than Bonior's previous opponents. During the campaign, Michigan's gubernatorial race became a key factor as Palmer hoped to ride the coattails of Gov. John Engler, who was expected to easily win re-election. The Republican nominee also tried to link Bonior with Geoffrey Fieger, the attorney for suicide doctor Jack Kevorkian and the Democratic Party's controversial nominee for governor. In return, the Democratic congressman criticized Palmer's personal and business finances. Bonior opposes abortion, which helps him in his relatively conservative district. 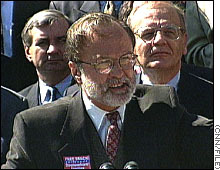 Since the Republican congressional takeover in 1994, Bonior has served as House Speaker Newt Gingrich's most severe critic. He filed an avalanche of ethics charges against Gingrich, and a few stuck, including those that eventually led to Gingrich's reprimand by the full House. The Democratic whip is also his party's chief vote-counter and a key floor strategist. Bonior brings to the job a deep concern for working-class people, a rhetorical style that is both controlled and passionate, and a willingness to stand and fight on principle even when the foe is his own party's president. His best known crusade was the fight against NAFTA, a trade agreement championed by President Bill Clinton that Bonior believed would cost American jobs. This year, Bonior led the Democratic fight in the House to increase the minimum wage by $1 by 2000. The measure was killed.